Today’s object is one that we have featured before: the will that Captain Daniel Bowie wrote on August 26, 1776, the day before he was killed in combat at the Battle of Brooklyn. For most of the year, Bowie had been a lieutenant in the First Maryland Regiment’s First Company, stationed in Annapolis. It wasn’t until July 6, four days before the Marylanders marched for New York, that he was promoted to captain of the Fourth Company. The Fourth had been based in Baltimore all year, and Bowie may not have even met any of his officers or men until a day or two before the regiment departed for New York. In addition, while a full-strength company had 74 officers and men, the unit Bowie inherited had just 58. Bowie was twenty or twenty-one years old, and like all of his men, had no prior military experience. The Marylanders lost 256 men that day, killed or captured. Poor record-keeping means that we only know who some of those soldiers were. We have identified five who died at the battle: Bowie, Butler, Captain Edward Veazey, Sergeant William Sands (who we featured a few days ago), and Private Thomas Connor. We also know of seventy men who were captured. For a full list see our Battle of Brooklyn Roll of Honor. The names of all the Maryland soldiers lost at the Battle of Brooklyn may never be learned, just as the final resting place of the Maryland 400 may remain a mystery. For today, however, Daniel Bowie’s will can serve as a reminder of all the Marylanders who died while holding back the British that day in New York. If you missed the other objects in this series, click here to view them all. 1. Will of Daniel Bowie, 1776, Prince George’s County Register of Wills, Wills, Original, box 12, folder 44, MdHR 8924-12-44 [MSA C1327-12, 1/26/7/4]. 2. Will of Joseph Butler, 1777, Harford County Register of Wills, Wills, Liber AJ no. 2, p. 31 [MSA CM599-2, CR 44758]. The quoted passage was recorded by the Register of Wills as a dictated oral will. 3. Letter, William McMillan to Secretary of Treasury, ca. October 1828. 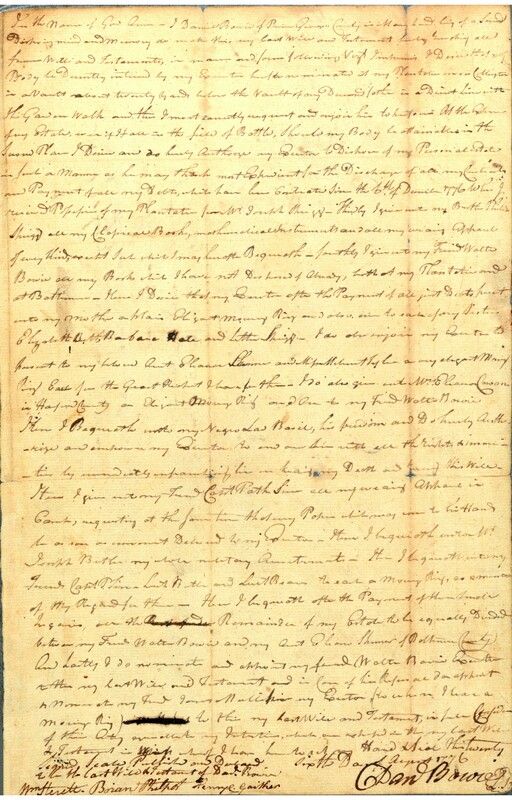 Pension of William McMillan, National Archives and Records Administration, Revolutionary War Pension and Bounty-Land Warrant Application Files, NARA M804, S 2806, p. 33-35, from Fold3.com. This entry was posted in Maryland 400 and tagged five objects. Bookmark the permalink.